How has Tic Tamer helped others? How do I use Tic Tamer? Motor tics are rapid and uncontrollable movements or spasms involving various muscle groups in the body. These are involuntary actions and they tend to occur in sudden bouts. Usually occurring on a daily basis, motor tics are almost always an unwelcome occurrence and are generally quite frustrating to deal with. Motor tics are more common in children than adults, however, in some cases they can continue into adulthood. Unlike voluntary muscle actions, motor tics are very difficult to control, and while some people manage to suppress them for a short time, it seldom lasts long. In fact, suppressing tics can be described as trying to suppress a sneeze that really wants to come out, and once released; most people feel a sense of relief afterwards. For many children, motor tics are transient, and disappear within a matter of weeks or months. This is especially true for children, who develop tics during periods of intense stress. For others, motor tics are a long-term problem which may last for years. When this is the case, a diagnosis of chronic motor tic disorder is often made. When motor tics occur together with vocal tics, then a diagnosis of Tourette’s syndrome may be considered. The cause of motor tics is not fully understood, however, much research has suggested that there is a strong genetic component, and therefore run in families. Other research has also suggested that the motor tics are related to brain chemical abnormalities or deficiencies of certain vitamins and minerals such as magnesium. Various factors have also been shown to trigger or worsen existing tic conditions and these include tension, stress, fatigue, illness, recent head injury, excitement, and certain medications. In other cases, tics are a symptom of other conditions such as Tourette’s syndrome. In today’s modern world, our brain needs to be taken care of as much as our other organs! It may seem rather odd – but the brain is the only organ that needs to remind us to take care of it! Following a healthy diet, (one low in salt), and drinking 8 glasses of water per day can help to keep the brain nourished and hydrated. A healthy nervous system also depends on the amount of time we take to ‘exercise’ our brains – doing puzzles and problem solving can also keep our brain and nervous system ‘oiled’. Another way to support the nervous system is to take time out to relax. Taking the time to do yoga, meditation or a relaxing sport to unwind can help the nervous system and brain to ‘re-boot’. Natural remedies can also help to support the nervous system and motor responses in the body. In fact, natural remedies have been used in traditional medicine for thousands of years to support the healthy functioning of the brain and nervous system. 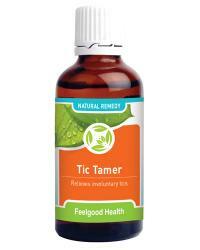 Tic Tamer is a 100% natural homeopathic remedy formulated for the control of common involuntary tics and jerking. Tic Tamer can be used to safely support the nervous system and brain, without harmful side effects. This remedy contains a selection of homeopathic remedies known for their ability to address common jerking and involuntary tics. Due to the concentrated tincture formula, Tic Tamer Drops are absorbed into the system with ease – exactly when you need it! Hyoscyamus 30C – this homeopathic remedy is beneficial for those who tend to give in to restlessness, often with jerky movement when they are enthused or worried about something. Zinc met 30C - is another homeopathic remedy that supports the absorption of minerals in the body. In addition, Zinc met. acts as a nervous system tonic to soothe the nerves at night as well as during the day. Cina 30C - is thought to be named after Artemisia - the queen of Persia and renowned herbalist in the 4th century BC. It is used homeopathically to relieve irritability, increase tolerance and prevent outbursts. Chamomilla 12C - is a well-known soothing and calming homeopathic remedy to address any common involuntary spasms. Tic Tamer contains no gluten, artificial flavours, colours or preservatives. It is suitable for vegetarians and safe for all ages. Tic Tamer is presented in a concentrated 50ml tincture formula, making it easy to take. Hold bottle upside down and administer 10 drops directly into the mouth. Alternatively dilute 10 drops in quarter cup water and sip slowly. Children under 12 years use 5 drops. Dosage may be repeated 3 - 5 times daily if needed until symptoms subside. May be used with Triple Complex Nerve Tonic. Tic Tamer supports the body on a cellular level – helping to support the nervous system - from the first dose. Tic Tamer contains homeopathic ingredients in a tincture formula that facilitates rapid absorption into the system – just when you need it! One bottle of Tic Tamer will last approximately 30 days (depending on frequency of use). Remedy to address involuntary tics plus all round nerve tonic! Remedy to address involuntary tics plus anti-anxiety formula! Remedy to address involuntary tics plus natural herbal antidepressant and anti-anxiety formula!